Spring calls for light bites to usher in the season. After a long winter, rejoice as fresh ingredients become readily available to chop, slice, and sauté into bright, delicious meals. But don't think appetizers are just for large gatherings. Having a little snack before an intimate gathering or even a family meal starts things off on a festive note. Or for an exciting and modern twist, consider serving simply small plates and cocktails and beverages for your next get-together and skip the sit-down meal altogether. Whatever you choose, get creative with plating these springy beauties, and relish in the bounty of the season. 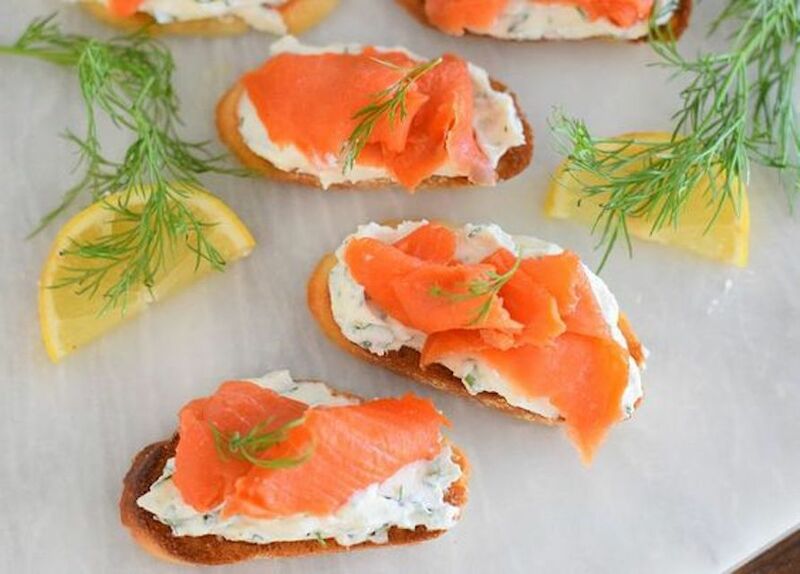 If you usually enjoy smoked salmon on a bagel with cream cheese, you'll love this appetizer twist on the classic. Fina ricotta cheese has the best texture for this recipe, but if you can't find it, the regular kind works just as well. Fresh spring herbs are a must for this recipe. Don't chop them too far in advance, to prevent them from browning. Wild salmon has the best flavor, if available. Not just for your corner hipster cafe anymore, avocado toast makes a lovely appetizer or a light breakfast or lunch. Avocado is rich in nutrients and adds such a pretty green color on your table. Avocado toast is as versatile as it is delicious. Try it with fresh spring herbs, a squeeze of lime, chopped tomatoes, a sprinkle of sea salt, or a pinch of red pepper flakes for spice. Not only will this simple and beautiful recipe yield bright and cheerful-looking deviled eggs, you'll also end up with pretty pickled beets! They only take 3 to 4 days to cure, and can be served as a unique part of a pickle platter, sliced on a sandwich or over a salad, alongside cold cuts for a light lunch, or any number of ways. You may want to make a double-batch. Is there anything that says "spring" better than the snap of fresh green beans? Brighten up the standard legume with this easy salad that features sweet, tangy clementines, bulgar wheat for texture, and savory feta for an appetizer that will delight the senses. Serve this colorful salad as the start to a sit-down meal, or with small plates for munching. If you've never experimented with quinoa, you're missing out on a great grain. It's wonderfully filling, cooks more quickly than rice, and makes a great base for fresh herbs like mint and parsley. Try this recipe to use up extra fresh herbs from other recipes, or as a light appetizer that makes perfect use of the first spring harvest. Since it works so well with a variety of toppings, try adding chopped fruit or veggies or sprinkling with a crumbly cheese like feta or blue. Salmon and cream cheese is a bagel pairing made in heaven, so bring it off the breakfast table and onto your appetizer spread with this delicious smoked salmon dip. Lemon juice and horseradish give it a tangy zip, and it's perfect atop crostini as a canapé or served with crackers or fresh vegetables for dipping. Allow at least a few hours for the flavors to meld and serve chilled for the best presentation. Once spring has sprung, a lot of us are ready to put down the heavy comfort foods of winter and pick up something lighter. But if you still want a little crunch, try these simple veggie crisps instead of potato chips. They're easy to make and you can sprinkle them with your favorite spice blend for extra punch. Use a mandolin to get the thinnest slices, which will come out just as crunchy as store-bought chips. Get out the grill and get ready to fall in love with halloumi in this rich and savory salad. Potatoes, green beans, and the popular Mediterranean cheese are a match made in heaven in this delightful appetizer or side. Mint and dill add a fresh spring flavor, while capers and red wine vinegar provide a zesty contrast. Sprinkle some extra fresh herbs on top before serving for a beautiful presentation. Delight your vegan or vegetarian guests with this bruschetta that makes great use of the first tomatoes of the season. Top sliced baguette or French bread with a mixture of tomatoes and basil, drizzled with good-quality olive oil and flaky sea salt. Bring out the good olive oil, or buy a small bottle to keep on hand for recipes like these. You can't replicate the rich, umami flavor of extra-virgin olive oil, and it will complement the tomatoes and fresh basil perfectly. There's nothing like the first tender shoots of asparagus as spring begins. Think beyond the breakfast table with this beautiful asparagus and leek quiche. If you serve it chilled and cut into slivers, it's also a great starter to a light meal, or as part of an all-appetizer party spread. And because it's meat-free, your vegetarian guests will love it, too. With a lovely grassy flavor and some sweetness from the melty leeks, its balanced flavor also makes a perfect leftover lunch or brunch the next day. When you buy kale chips at the store, they're often coated in artificial flavoring, but if you make them at home, you control the ingredients. They're very easy to toss together the morning of a party, and are a nice, light bite to enjoy as part of your spread. Tender, early kale makes a crisp snack, especially when sprinkled with flaky sea salt. Use fresh basil leaves to give this walnut and cream cheese spread its sweet herbal flavor. It takes just minutes to make and can be stored covered in the refrigerator until you're ready to use. Serve it with crackers, pita chips, or slivered French bread. Pecans or toasted pecans also work well in this recipe, if you're not a fan of walnuts. 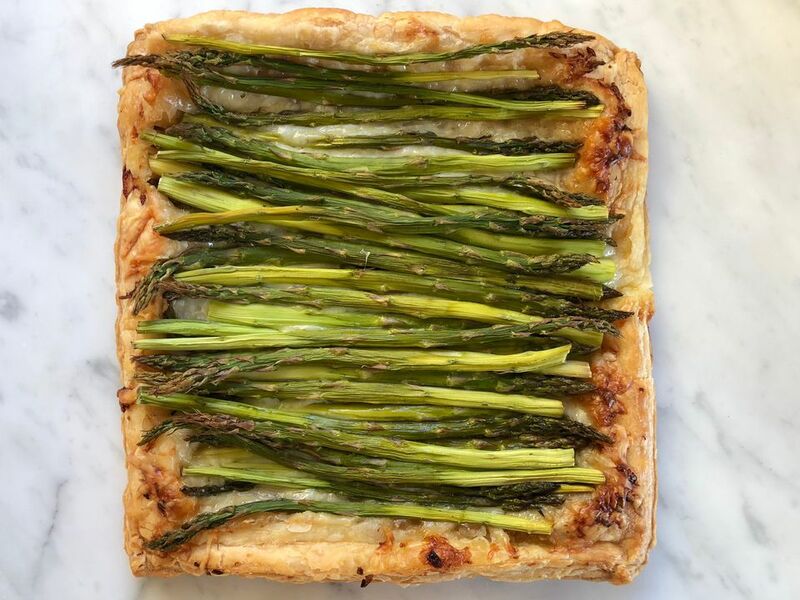 You'll want to buy thin, tender asparagus shoots for this rich, savory gruyere tart. Store-bought puff pastry makes it easy as pie, too. Defrost the pastry overnight in the refrigerator, or leave it on the countertop for about two hours before using. To prevent your guests from getting all tips or all ends when slicing, alternate the direction the tips face, when laying the shoots on top in those pretty rows. Spring rolls aren't as difficult to make as you might think, once you get the technique down. These vegan spring rolls use cabbage, tofu, and fresh mint for a kicky spring flavor, but you can use cilantro or basil or any other herbs you prefer. Serve it with a soy dipping sauce. This recipe can also be made gluten-free, but make sure to check the label on your soy sauce and wrappers, to be certain. While these Southern-style deviled eggs don't use any spring ingredients specifically, they taste great alongside your other vegetable-forward dishes. A bit of sweet relish gives this classic recipe a Southern flare, while a dash of Tabasco kicks it up a notch. Pimento makes a great garnish, but you can also sprinkle the finished eggs with fresh chopped dill if you've got some on hand. If you've never tasted pickled shrimp, you're in for a real treat. Set aside at least four hours to marinate the shrimp, turning frequently to ensure even soaking. While this recipe calls for fresh chopped dill, this is a great opportunity to use whatever spring herbs you've got on hand. Tarragon, snipped chives, or chopped thyme all taste great. Serve with toothpicks for an easy appetizer, and toss the extras with a salad the next day for lunch. Switch up your usual crudite platter for these grilled spring vegetables that will kick off grilling season right. They're as perfect as an appetizer as they are as a side for your first cookout of the year, and showcase the bright, fresh flavors of the produce. Leave 20 to 30 minutes to marinate the veggies for the best-tasting results. Make the most of toothsome spring asparagus and delicate butter lettuce in this unique and fresh salad. Little creamy mozzarella balls and nutty pistachios add a delightful contrast to the grassy, clean vegetables. Set out small plates for the salad if you're doing appetizers only, or start off a meal with this light bite that won't spoil your appetite for the main event. Garlic scapes have a delicate garlicky flavor which is perfectly showcased in this bright and zesty scape and basil pesto. Adjust the ingredients to taste, depending on your preferences. It tastes great spread over crostini with ricotta or cream cheese as an appetizer, or stirred into sour cream as a dip. Make extra to serve over pasta, or as a sauce for grilled chicken or fish. These Thai basil lettuce wraps with beef are just as much fun to eat as they are delicious. Use the first tender lettuce of the season for the wrapper, and fresh herbs like basil to add zippy flavor. They're perfect for anyone watching their carbs, but those without dietary restrictions will find them addictive, too. They also work wonderfully as a light lunch or dinner, in addition to an easy finger food for your party.